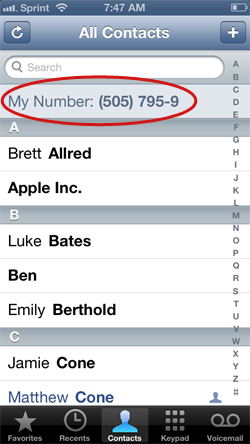 When you activate a new iPhone, your carrier provides you with documentation that contains the iPhone's phone number. But if you haven't yet committed the phone number to memory, or if you live in the United States and use a different phone number with Google Voice, you may need a quick way to find your iPhone's number. Fortunately, there is a quick and easy way to do it as long as your iPhone is already activated with a standard SIM card. From the iPhone's home screen, tap Phone. Scroll to the top of the list of your contacts. Your iPhone's phone number is shown at the top of the window, as shown below. Now you have quick and easy access to your iPhone's phone number wherever you go, and you can put off committing the phone number to memory for a little while longer.